While its “all eyes on U.S. stocks” today given technology’s trip back behind the woodshed, there are developments going on in other markets that probably merit one’s attention. Bonds and currencies, for example, are undergoing some potentially pivotal moves at the moment. Additionally, there are some interesting things developing in international stocks as well. Not the least of these is the fact that the German DAX Index is presently testing the level of its April breakout to all-time highs around 12,400. 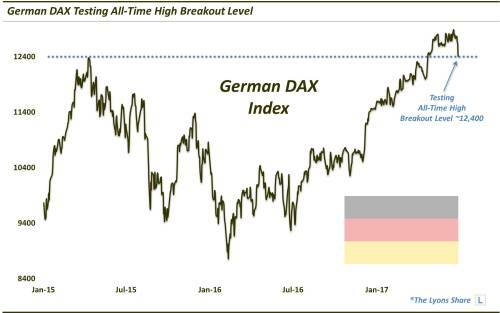 The DAX initially forged a top in the 12,400 range (specifically, 12,391) back in April 2015, following an explosive Europe-wide breakout earlier in the year. That was “all she wrote” as far as those heights were concerned, however, as the German market would spend the full next 2 years trading below those levels. Finally, this past April, the DAX was able to surmount its 2015 peak. After a bit of follow through higher, the DAX has spent the last 2 months meandering sideways. Today, largely lost amidst the “tech wreck” on Wall Street, the DAX came back to test the level of its April breakout to all-time highs, recording a low of 12,396. If April’s breakout was legitimate and a new durable up-leg is in the cards, we should see the DAX successfully hold this test of the ~12,400 level, or at least in the vicinity. In short, look for the DAX to hold support in this general 12,300-12,400 vicinity. Such a hold would be the first step in launching the next up-leg to the rally that kicked off in December. On the other hand, a failure to hold would not necessarily put an end to the 6-month rally. However, it would likely open up downside to a test near the 12,000 level prior to trying another rally attempt. The iShares MSCI Germany Index Fund ETF (NYSE:EWG) was unchanged in premarket trading Friday. Year-to-date, EWG has gained 14.73%, versus a 7.97% rise in the benchmark S&P 500 index during the same period. EWG currently has an ETF Daily News SMART Grade of A (Strong Buy), and is ranked #5 of 90 ETFs in the European Equities ETFs category. If you want the “all-access” version of our charts and research, we invite you to check out our new site, The Lyons Share.